Want to enjoy and relax in a traditional Mexican villa with all the modern amenities? Do you enjoy mountain views and nature? How about visiting nearby colorful local markets and historical sites? Villa San Clementito is the place for you. Villa San Clementito is a ten acre property that affords comfort and privacy in a semi-rural mountain setting with spectacular mountain and valley views. Villa San Clementito's setting provides for relaxing comfort in the beauty of the mountains and nature. The area's craggy mountains and jagged cliffs are spectacular and at 5500 feet above sea level, the area boasts moderate weather throughout the year. Hiking opportunities on easy to challenging trails abound in these magical mountains. The Hacienda Features: * Spacious and comfortable home built in 2002 with all the modern conveniences. * Two full bedroom suites plus a third smaller bedroom, all three with private full bath. * Swimming pool with current-lap pump. * Tennis court and lounge with pool table and stereo sound system. * Attentive staff who live in a completely separate home on the premises offer daily housekeeping service and limited kitchen assistance (included)----breakfast available for an additional charge. * Fabulous view of surrounding mountains and valley below. * Modern professionally-equipped kitchen with Thermador stove. * Secured grounds with staff on premises 24 hours, plus central alarm system. * Outdoor terrace overlooking mountains and valley, with gas barbecue grill. * Dining room with seating for 12. * Television with satellite programming accessing English-language channels. How to Get There: * One hour drive south of Mexico City Airport via modern toll road. Map and instructions available upon request. Chauffeured transportation from Mexico City, to Mexico City or for day trips available at additional cost. * For air travelers from the United States, Mexico City is two and one-half hours from Dallas. More pictures available in jpeg files of less than 100kb by e-mail upon request. I came to Mexico in 1976, intending to be here for two years, and I am still here. I have managed the first relocation company in Mexico for all this time, helping executives move their families to this wonderful country. We have used that same experience to provide a unique hospitality in Tepoztlan. Nothing can block your view of the mountains nor the valley 50 miles away. 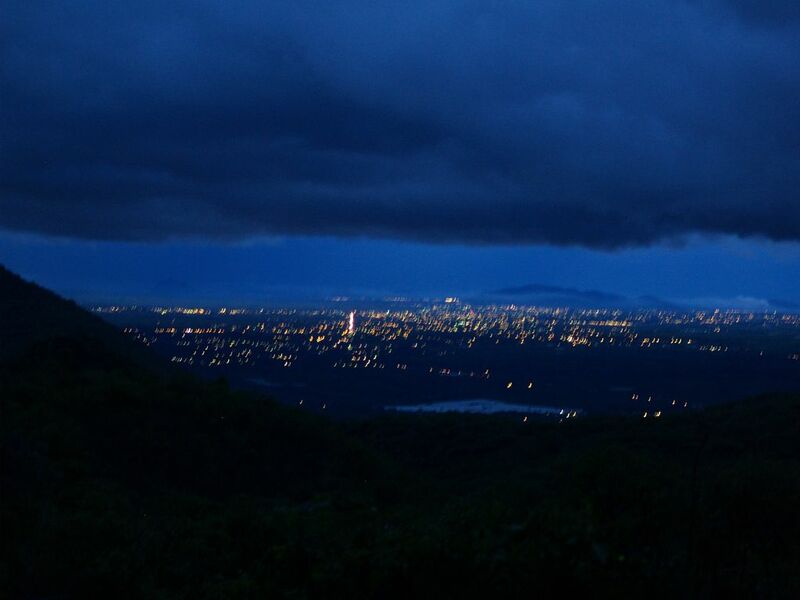 Shimmering lights from the valley complete the evening panorama. Bring your laptop; sit 'most anywhere, enjoy the views. Dishwashing by staff is included in the rent. We don't have a bicycle but this webpage won't let me remove the "1"
Great stay between the mountains! We had a great experience at Villa San Clementito. We had fast and direct contact with Patricia from the beginning. All the staff was extremely nice with us. The rooms and green areas were comfortable and spacious. The kitchen was traditional and modern, fully equiped! Waking up with the sound of nature was very special. We fully recommend san clementito for anyone who wants a relaxing space for a big family. Thank you! Come back soon! The mountains are constantly changing so you need to see them often. This is my go to place for peace and relaxation. I have been multiple times and will go again. The views are stunning, from the verandas of this clean, welcoming and well maintained oasis. The owner and staff go out of their way to make your stay what you want it to be. I love going into Tepo for the market on Wed and the weekend. Relax and enjoy the wonderful spot. Loved your visit! Come back soon! Beautiful summer villa with amazing views. I had an amazing stay at Villa San Clementito last year. The villa is beautiful, quiet with a wonderful staff that prepared delicious meals, cleaned and basically responded to our every request. We took strolls around the area, spent time in the little town and basically had the most relaxing time. The views from the yard are absolutely spectacular. I would highly recommend this villa. Visiting the village of Tepotzlan is a something I do at least annually...sometimes more! When planning, I always check the availability of Villa San Clementito --- in my opinion it is the only place to stay! The staff is second to none in client concerns --- from preparing special meals to making beds --- absolutely nothing is overlooked! The owner, Patricia, is amazing and I am certain her picture is in the dictionary for "hospitality" --- need I say more? The property is well located, beautiful, clean and the amenities leave nothing to be desired! I am please to recommend this property, its staff and owner to everyone ---- make your plans to visit Tepotzlan and be certain to make your reservations at Villa San Clementito!! Thank you! You're always welcome. This is a dream destination for those attracted to rural serenity, space in which to roam around exquisite grounds and trails on the property, and to interact with a culture rich in art and history. San Clemente, its amazingly gracious owner Pattie Hogan, and the small group of "family" that attended to our needs, impressed my wife and me as an unique gem with relatively easy access to nearby Tepotzlan, Cuernavaca, and Puebla. Our week of luxury living, surrounded at all times by astounding beauty, passed all too quickly! We had an amazing stay at this piece of paradise in Mexico! The staff was amazing, the food was fabulous and the owner was beyond accommodating and welcoming! With two pools, a billiards area, tennis courts and grounds that you could spend your entire vacation exploring, there was so much to do! Swimming pool and tennis court on property, Prior arrangements can be made for on-site massages, Excellent Hiking, Yoga, massage, horseback riding can all be arranged. Pricing is for up to 6 guests per night. Additional guests will be charged $50/per person per night or $250/per person per week. Children 2 and over are charged as adults.